Not surprisingly, Boston’s Theatre District hotels include some of the most glamourous and trendy places to stay in the city. When you're coming to Boston to see a show in the Theatre District, these hotels put you right in the center of the action. If you’re looking for a sophisticated ambiance close to the theaters, many fine restaurants and bars, and Boston’s liveliest nightlife, these hotels deliver a great performance. Since Boston is quite compact, you'll also be close to the Common, the historic Freedom Trail, the sizzling Downtown Waterfront, and most other top attractions. Choices range from 5-star luxury to glam to affordable - so whatever your budget, you can find the perfect hotel right in the middle of the action. Take a look - and then make your reservations! Boston’s Theatre District stretches along an L-shaped area formed by Boylston and Tremont Streets. All our recommended hotels cluster within a block or two of at least one theater - and none are much more than a 5-minute walk from all of the theaters. 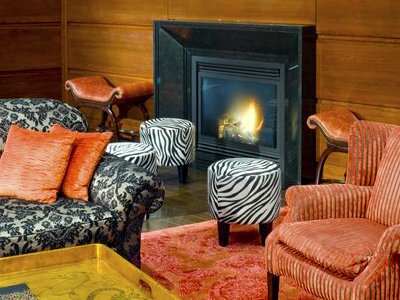 The W Hotel Boston brings glamour and glitz to the heart of the Theatre District. If you're looking for a non-traditional ambiance, you'll love the exciting colors and trendy design. Ask for an upper-floor room overlooking Boston Common for spectacular views. Close to the Wang, Shubert, and Wilbur Theaters, and the Charles Playhouse, and about a 2-minute walk to Shakespeare on the Common in the summer. The Revere Hotel boasts a super location at the edge of the Theatre District and Back Bay, only 2 blocks from the Public Garden. You'll love the rooftop terrace, private balconies, glass-enclosed swimming pool, and the lively Emerald Lounge. The Revere's nicely appointed 356 guest rooms and suites tend to be larger than at many comparable downtown Boston hotels, making it popular with families. The Revere is close to the Wang, Shubert, and Wilbur Theaters, and the Charles Playhouse. The Cutler Majestic and Colonial Theatre are just a block further away. The Godfrey Hotel, a glamorous 4-star jewel located on Washington Street in the midst of theaters, restaurants, and clubs, gives you a bird's eye view of this lively part of Boston. You'll enjoy being able to walk everywhere in just a few minutes - although with all the luxury touches including Frette linens and complimentary high-speed WiFi, you may want to stay in. Check out the special deals when booking - you'll usually find some good ones. If you're looking for an affordable hotel in the Theatre District, check out the reasonably priced Courtyard Boston Tremont Hotel. You get almost exactly the same location as the much pricier (and trendier) W Hotel up the street, and usually significantly cheaper rates. And if you're looking for lively nightlife, the Royale and Underbar in the building's lower level couldn't get much closer. A dramatic lobby and free wifi add to the attractions. Close to the Wang, Shubert, and Wilbur Theaters, and the Charles Playhouse. An indoor pool helps you keep fit. There is an on-site restaurant, but you'll also find a huge variety of terrific restaurants of all types in the surrounding blocks. The Hyatt Regency focuses on the business travel sector during the week - so look for money-saving packages and specials on the weekends. Also one of the most convenient downtown hotels near Boston nightlife venues. Close to the Opera House, Paramount Center, and Modern Theatre. Boston's 5-star Ritz-Carlton overlooks Boston Common and offers the fine amenities and top service you'd expect. You can expect quiet but sumptuous luxury and plenty of special touches to make you feel at home in your room or suite. Close to the Opera House, Paramount Center, and the Modern, Cutler Majestic, and Colonial Theatres. The Park Plaza's lavish lobby rivals Boston's most ornate theaters for grandeur. Choose a small, relatively inexpensive room - or one of the grand suites - you'll find something here for every budget. Close to the Wang, Shubert, and Wilbur Theaters, and the Charles Playhouse, with the Colonial Theatre and Cutler Majestic also nearby. Superb service and a spectacular location overlooking the Public Garden make the 5-star Four Seasons the favorite Boston luxury hotel of many business and leisure travelers. There's a nice indoor pool, fitness area, terrific on-site dining. 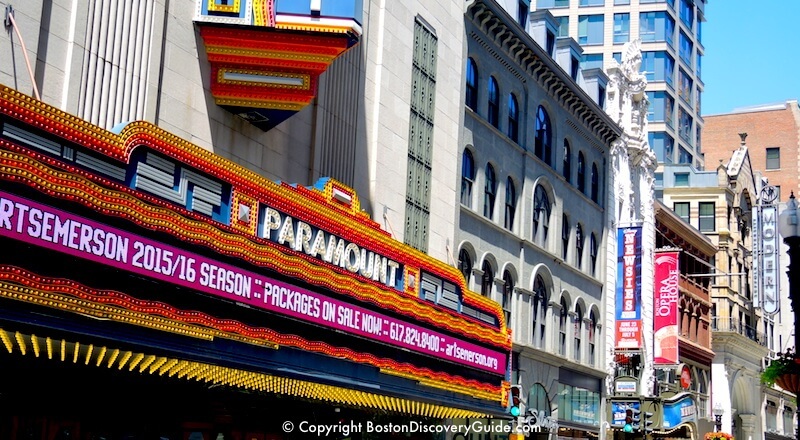 The Four Seasons Boston is close to the Wang, Shubert, and Wilbur Theaters, and the Charles Playhouse, with the Colonial Theatre and Cutler Majestic also nearby. The Doubletree Hotel sits a bit beyond the center of the Theatre District, but its affordable rates make it popular with business travelers who want a convenient Downtown Boston hotel and savvy leisure travelers looking for a bargain near the theaters. The Doubletree is close to the Wang, Shubert, and Wilbur Theaters, and the Charles Playhouse. The 64-room Found Hotel on the edge of the Theatre District is also close to Boston Common and the Public Garden as well as tranquil Bay Village. Closest theaters: The Wang, Shubert, and Wilbur Theaters, and the Charles Playhouse.